"I love this recipe that my Aunt Rita makes! It's easy and very soul warming. It goes well over rice, egg noodles, pasta, mashed potatoes, or by itself with garlic bread on the side. For a vegetarian option or vegetable side dish option, just omit the sausage. Use spicy sausage if you like it hot." Cook the sausage with onion and garlic in a large, deep skillet or pot over medium heat, until the meat is browned, 10 to 15 minutes, stirring frequently. 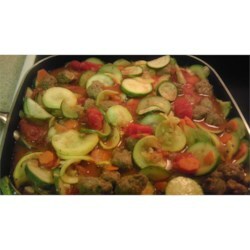 Mix in the summer squash, zucchini, carrots, mushrooms, and stewed tomatoes, reduce heat to medium-low, and bring the mixture to a simmer. Cook, stirring occasionally, until the vegetables are tender, about 20 minutes. Sprinkle with Parmesan cheese, and serve. I use my food processor to slice all the vegetables. Delicious. I didn't use the mushrooms to make it more kid-friendly. Great summer meal. Thanks! As I am vegan, I omitted the meat, used Portabello mushrooms, and served the cheese on the side. It was a huge amount served as the only dish, and every drop was delicious! awesome !!!! love this, and so will everyone else!! I liked this - it reminds me of a mexican soup called albondiga (not sure on the spelling) I think I would prefer it with ground beef and more sauce. Like this with fresh corn off the cob.